My oven is temporarily out of commission. My beloved Viking six burner gas stove has not been turned on since before Halloween. And no, it’s not because I haven’t felt like cooking. Even if life has been chaotic lately, as you know, I find cooking cathartic. Unfortunately, the lovely people at Con Edison saw fit to turn off the gas for my entire apartment building, and it’s still shut off for my unit. So I’ve had to be creative. Armed with a slow cooker, sous vide machine, microwave and toaster oven, I was already in good shape. But I couldn’t fry an egg. So one quick purchase of an induction burner (great deal at Zabar’s on a Fagor model) and new ceramic pan with a stainless steel bottom (Zwilling at Bed, Bath & Beyond), and I was set. Unfortunately, this has impacted my ability to come up with new recipes for you. I’ve mostly been making slow cooker meals and using recipes I’ve already posted with a few tweaks. But when we were craving ribs and baked mac and cheese, I decided that I’d share how you can still make these comfort foods without a regular oven. 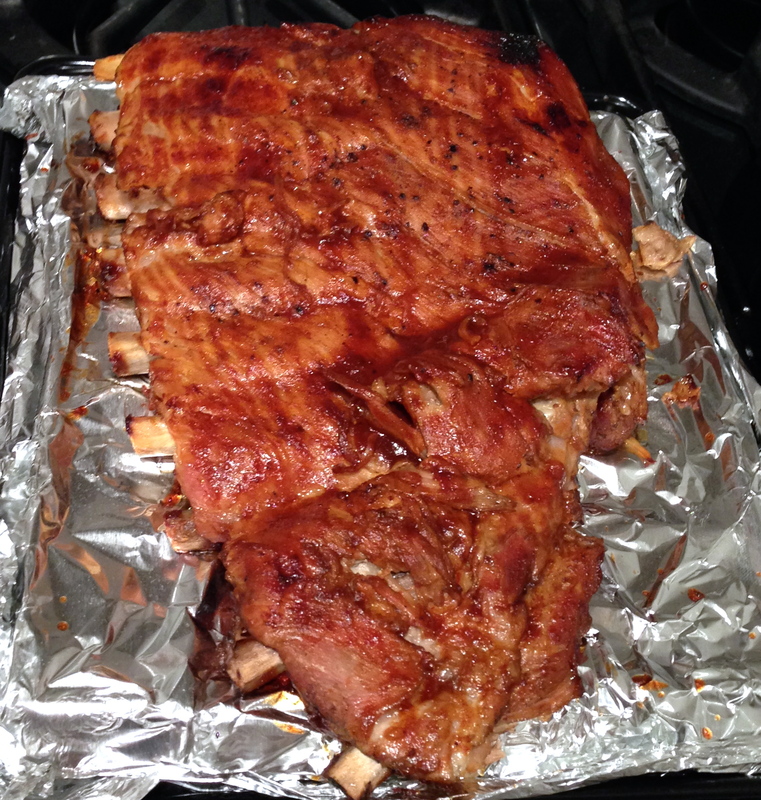 For the ribs, I put one rack of regular spare ribs in the crock pot with some salt, pepper and smoked paprika and a beer. After 6 hours on low, they were falling off the bone. Then I basted them with some bottled Stubbs BBQ sauce and broiled them in the toaster oven for 5 minutes on each side. Delicious! 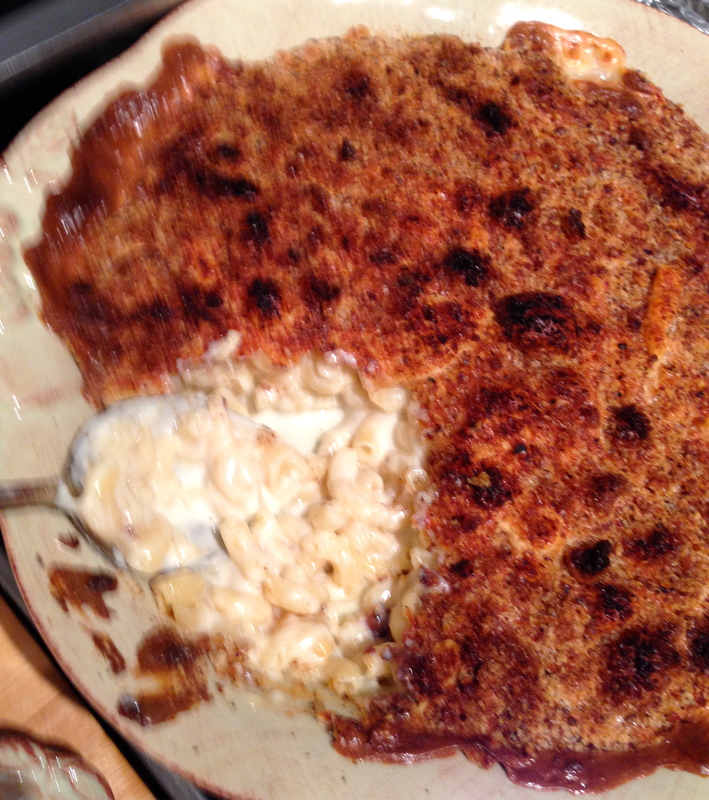 In the meantime, I tried my hand at the Modernist Cuisine mac and cheese concoction…again. This time I went with my instincts and had MUCH better results. On the induction burner, I brought a pot of salted water to a boil and then cooked half a box of elbows for 5 minutes (slightly underdone). Then I rinsed the pasta with cold water and tossed in a bit of oil so the pasta didn’t stick while I was making the cheese sauce (remember I have only one burner). 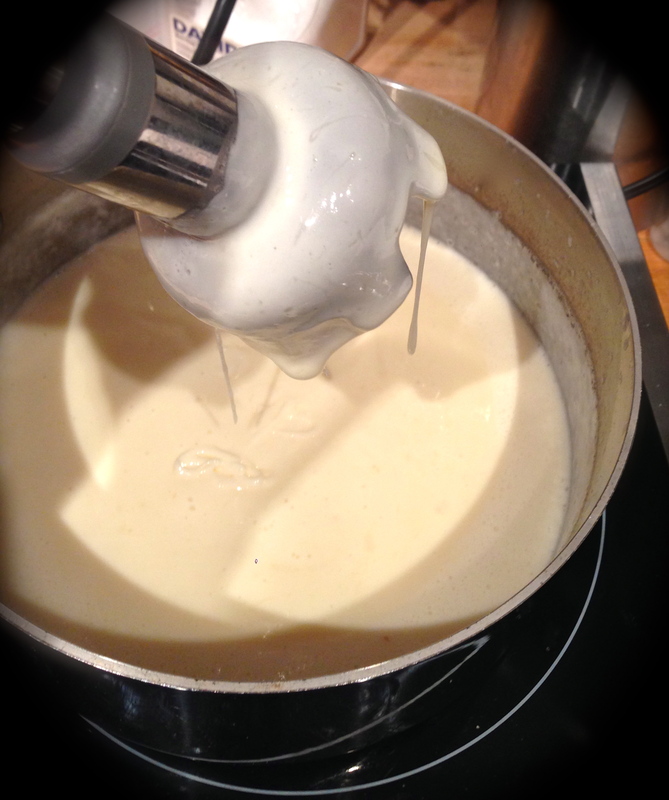 For the cheese sauce, I whisked 1 and 1/2 cups of half and half and 13 grams of sodium citrate until dissolved. (The recipe calls for 1 cup of water or milk.) Then I brought that to a mild simmer and then lowered the temp and slowly blended in 4 cups of cheese (gruyere, swiss and manchego) with my immersion blender. I raised the heat one notch as needed to ensure the cheese melted. And I got the creamy consistency that I wanted! I poured the elbows into the cheese, and added a couple dashes of cayenne pepper and mustard powder, and stirred to combine. Then I poured the mixture into a pan that would fit in my toaster oven, which was preheated to 350 degrees. 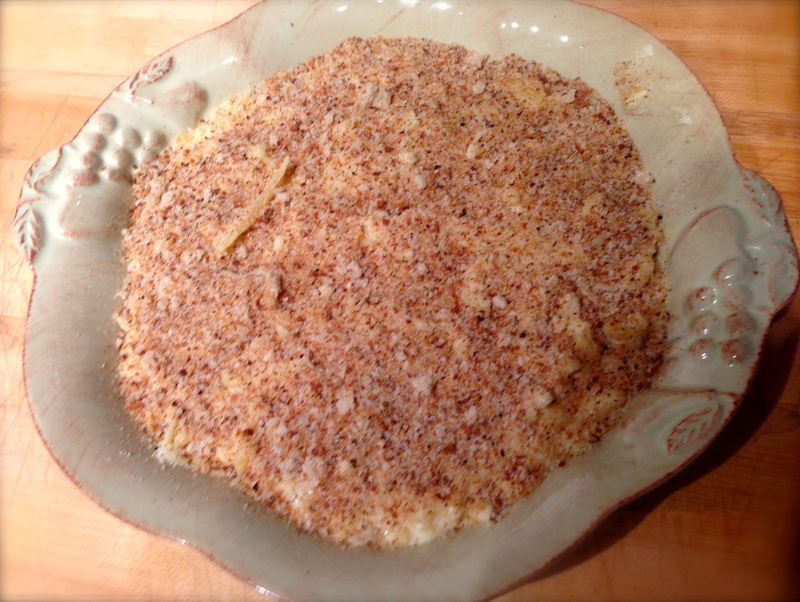 I sprinkled some parm and homemade bread crumbs on top. Then I baked the pasta for 25 minutes until bubbly. I timed this so that it would be finished when my ribs were done in the slow cooker and then it was still hot when I needed to put the ribs in the toaster oven. And it was a success. Do I miss my oven? Tremendously. Can I still cook? Absolutely. 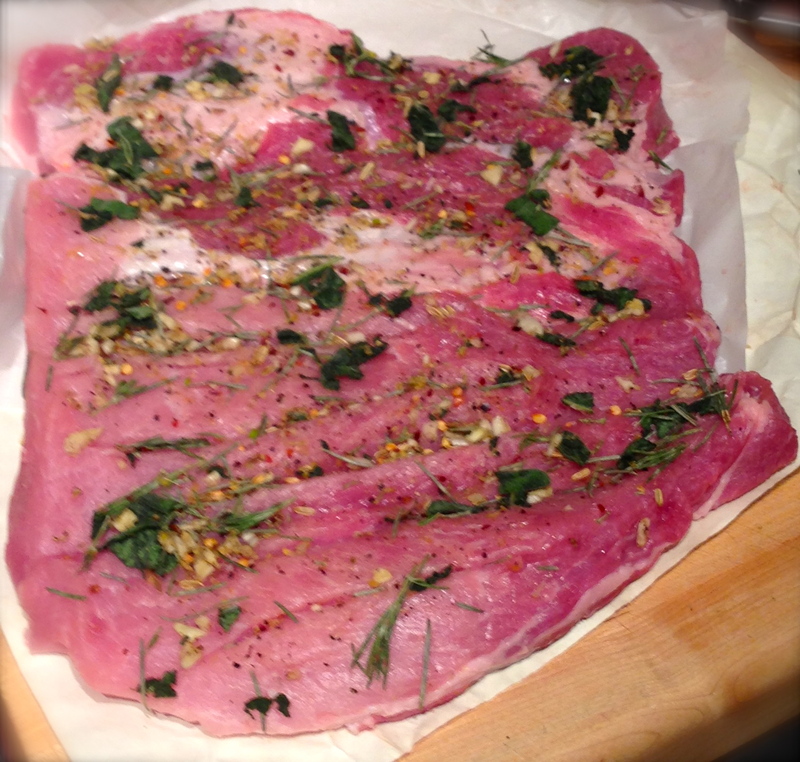 Now I’m prepping a mock porchetta to make in the toaster oven for New Year’s Day in honor of Judy Rodgers…and hopefully by the end of January 2014, I will have gas back and maybe a slightly renovated kitchen along with it. Sending this horrible year off in style with opening night of Die Fledermaus at the Met followed by some Champagne and fancy bites at home to accompany it before checking out the fireworks in Central Park. Happy New Year everyone! You must feel how I feel when I’m cooking out of my own kitchen, and a bit worse because it IS your own kitchen for the time being. Kudos that you are still cranking out great food! Thanks Stefan. I’m getting ready to do 72 hour sous vide short ribs. So making the best of it! Happy New Year! Yum! That’s certainly not the worst… 133 degrees? For 72 hours that seems a bit high to me. I’d recommend to check after 48 hours if you go for 136. Have you ever had meat so long in the SV that the texture became ‘powdery’? First foray into this length of cooking time. Will read your post and go with your advice. As you know, I’m a skeptic about MC recipes. Me, too! I’ve just done chicken gizzards SV for the first time. MC said 12 hours at 140. They were, let’s say ‘crunchy’. So I let them go for 12 more at 148. I will try 24 hours at 148 next, but I think that even 48 hours at 148 will be needed. I’ve done wagyu short ribs 72 hours at 131, but regular short ribs in my experience require 135 to become tender.